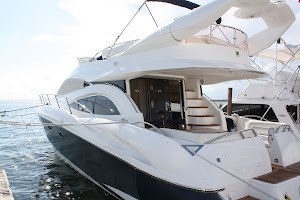 Fishing boats, Luxurious yachts and Catamarns for rentals at this the ocean side marina. Marina Hacienda del Mar puts at your disposal a world of services that will make the difference in your visit to our marina. With access to Sea Adventure Resort & Waterpark, you will enjoy all the facilities and amenities that our family resort in Cancun offers too. Marina Hacienda del Mar offers modern facilities and excellent services to create a successful experience with us. Have you ever dreamed of having an exclusive party aboard one of our luxurious yachts? Now Marina Hacienda del Mar is not only offering you yachts and catamarans for rent, but also the opportunity to hold your events aboard them. Don’t look any further, you have found the right location for that fantastic celebration. Whether you want to commemorate your birthday, an anniversary or a gathering with your friends, our marina is giving you the option of reserving our yachts, deck, and gourmet restaurant Oysters & Ostras so that you can turn this special event into an unbelievable occasion. If you wish so, we will also take care of every detail of the celebration and you will just have to relax and enjoy your party. Our Full Service Marina is an official "Port of Entry", thus we can help you process the immigration and customs paperwork. Whether you come for the Great Sail fishing, diving, our culture or just sailing thru our beautiful beaches at Marina Hacienda del Mar will make your stay a breeze.